This post is sponsored by Syneron Candela. I thought I’d be older before I’d be coping with menopause. My own mother was tight-lipped about her own experience when she went through it and now doesn’t remember the process. I’ve had to rely on older friends, books, and the internet to gather information about what to expect and how to cope. Luckily, I have some pretty candid friends who have freely shared their experiences and advice with me. For some reason, many women (like my mother) view the topic as taboo or simply too embarrassing to discuss. As someone who shares her entire life on the internet, I don’t have similar reservations. Whether you’re already experiencing menopause, or you just want to be prepared, this personal guide to menopause contains everything you need to know but might be afraid to ask. This was the biggest shocker for me. I just assumed it was sometime after 50. Imagine my surprise when I started skipping periods earlier this year (I’m currently 45). It turns out 45-55 is the average age range for menopause to begin. It’s not considered “early” unless it starts before age 45. A condition known as “premature menopause” starts before age 40 and is extremely rare. The easiest way to estimate when menopause will affect you is to find out when the other women in your family experienced it. Menopause has a strong genetic link. Ethnicity also plays a small role. Hispanic and African-American women tend to reach menopause a little earlier than average, and Asian women reach it a little later. Other factors play a role too. Smoking, chemotherapy, and ovarian surgery are all linked to earlier onset of menopause. Other than hot flashes, I didn’t know what else to expect. Menopause has several other symptoms, though not everyone experiences all of them. Although some women have difficulty sleeping during menopause due to hot flashes, many of us just find ourselves wide awake at night for no reason. On the plus side, responding to your friends’ e-mail messages at 1 a.m. goes a long way in convincing them you’re super human and can function on little to no sleep. Pardon my non-medical terminology, but it’s the best description for what I consider the worst symptom of menopause. Many menopause symptoms lists cite “memory problems” but another trademark symptom is difficulty focusing. The best way for me to describe it is that a fog settles in my mind and I have to work to clear it away to get to the information I need. Unfortunately, this brain fog is hard to hide and that super human image you created with your insomnia, disappears in the mist. 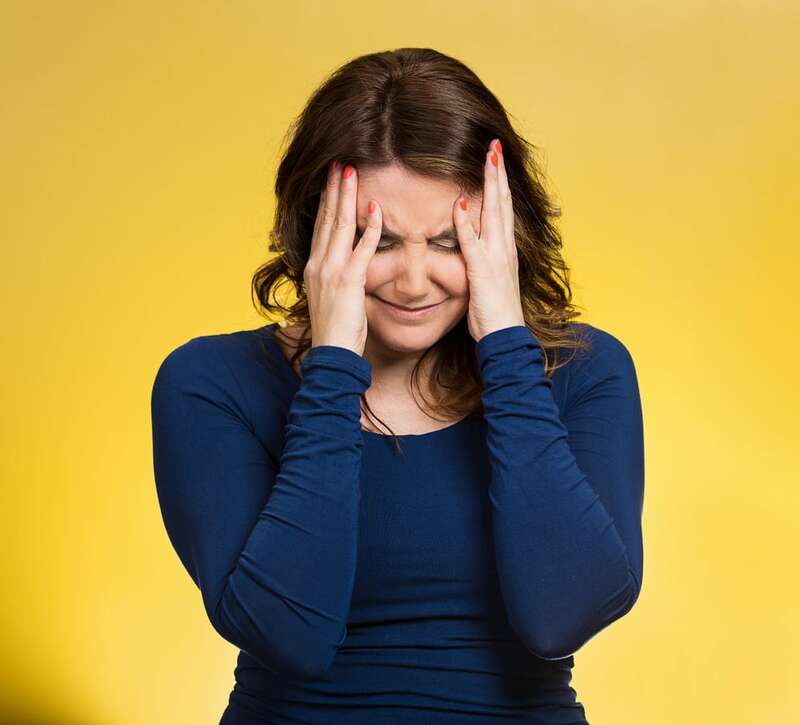 Some women begin having migraines during menopause or the severity of their migraines increases if they’ve been long-term sufferers. Hormonal migraines do typically stop after menopause, but they can be one of the most difficult symptoms to cope with in the meantime. This isn’t one of the symptoms I’ve had to deal with, but I’ve often been tempted to fake it to get out of doing chores. It’s no surprise that as your hormone levels change, your moods will change with them. I’m in complete denial about this one. From my perspective, I’m as delightful and charming as ever. However, my family has a different opinion. My metabolism started to slow two years before my other menopause symptoms. 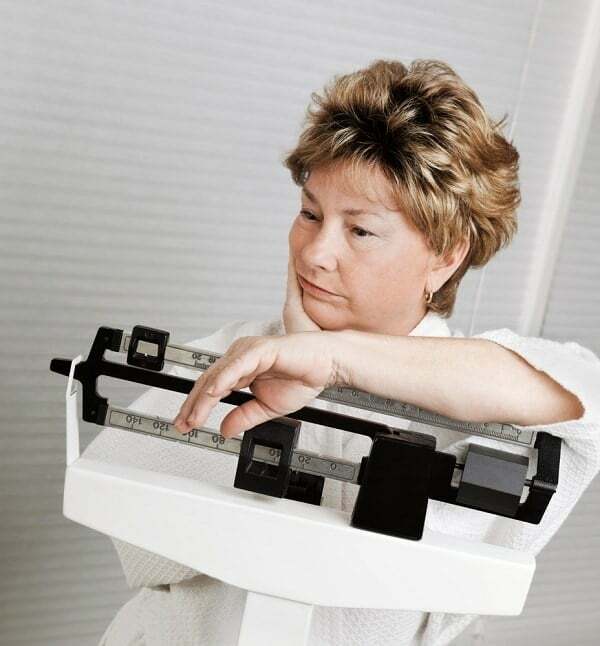 Unfortunately, the hormonal shift that occurs during menopause can make it even harder to manage your weight. In case your self-esteem isn’t suffering enough, menopause tries to put you down for the count by messing with your hair too. You might start noticing a lot more loose strands in your shower drain or in your hairbrush. Don’t worry! Nature’s going to make it up to you by having it grow in on your chin and cheeks. Of course, not everyone ends up with facial hair. Instead, you might end up with adult acne. Sadly, no one accidentally mistakes you for a 16-year old during these breakouts. Since your libido typically peaks right before and after ovulation, once you stop ovulating, it might stop kicking in altogether. If you don’t want to hurt your spouse’s feelings, this is a good time to start faking those migraines. Lower estrogen levels change your vaginal tissue, which can make physical intimacy uncomfortable. That’s right, when you finally muster up the energy to overcome your waning libido, you have a hard time enjoying the event and might even find it painful. Menopause – the gift that keeps on giving. Lower estrogen doesn’t just mess with our vaginal tissue, it affects our urethral tissue too. Luckily, this is one symptom I haven’t endured yet. I’m surprised since, from what I’ve learned, it’s very common. Of course, after 4 children, I already have to tighten all those muscles every time I sneeze or laugh so maybe I do have this problem but just can’t tell the difference. This symptom is markedly absent from many of the lists I’ve seen, but it’s a very real side effect of all the other symptoms. You’re feeling unattractive (thanks to weight gain and incontinence), frustrated at your ability to get things done (that “mental fogginess” I mentioned), and your relationships are suffering (due to mood swings and intimacy difficulties). Oh yeah, and by the way, you’re old. Nature is sending you a strong message that “your work here is done” – or that’s how you think of menopause in your darkest moments. How Do I Cope with Menopause Symptoms? 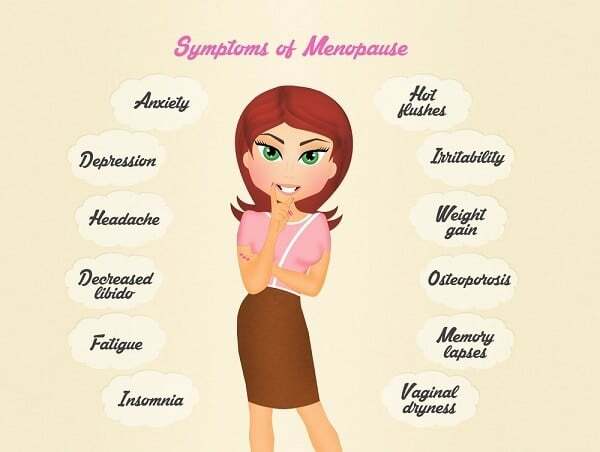 If you weren’t depressed about menopause already, you probably were by the time you got to the end of the list of symptoms. Don’t worry! While it’s true that you can’t turn back time, there is plenty that you CAN do to avoid or limit menopause symptoms. There are literally dozens of remedies for each symptom listed above. Instead of listing them all, I’m going to highlight those that treat multiple symptoms and those that are the most effective. You knew I was coming here next, right? Just like exercise, a diet rich in nutrients provides many benefits beyond improving your health. It will help ward off weight gain, can mitigate mood swings, and can also help clear up that mental fog. Isn’t it funny how so many of the effective remedies for menopause symptoms are the same things that are recommended for your general health? Drinking plenty of water will help regulate your internal temperature to prevent hot flashes. Proper hydration can also help against migraines and acne. While keeping a diary MIGHT help you cope with depression, that’s not what I’m talking about. If you are suffering from menopause symptoms that interfere with your daily activities (e.g. hot flashes or migraines), keeping a food journal can help you identify triggers. When I started noticing hair loss, I began adding some essential oils to my shampoo with noticeable results (check out my recipe for Rosemary Mint Shampoo). Clary sage is rumored to be effective in balancing hormones, as is thyme. And peppermint oil has a cooling effect which is helpful if you experience hot flashes. To me, the most traumatic of the menopause symptoms are those that undermine my self-confidence. I can only imagine the embarrassment and frustration that accompanies the incontinence that many menopausal women endure. And painful physical intimacy with your spouse? At a time when you need the love and support of your soul mate the most, it’s almost cruel that nature introduces a barrier to togetherness. Since there isn’t much you can do to stop the changes that occur in your urethral and vaginal tissue, and because these changes are permanent (unlike many of the other menopause symptoms), non-surgical CO2RE Intima laser treatment is a great solution. The treatment remodels vaginal, labial and vulvar tissue fibers to restore flexibility and shape. Most patients experience symptom relief after just one 10-minute treatment. A typical treatment series consists of three in-office treatments spaced about 3 to 4 weeks apart. Doctors recommend maintenance treatment of one visit per year to maintain symptom relief. To learn more and to find a doctor in your area that offers treatment with CO2RE Intima, visit www.co2reintima.com. Do you have questions I haven’t answered or advice I didn’t include? Let me know in the comments! Let’s face this life change together. Nice post. It’s great to see that women are talking about menopause. It’s so nice that women are talking about menopause now and not buying into the whole “this isn’t something we discuss” line of thinking. I’m glad there are options out there for us now too. I just turned 45 and was shocked that I’ve started to show signs of menopause as well. It is great to know this procedure is out there if I need it! I’m super interested in the technology behind this as I’ve done some research around light therapy for men. Of course for us it’s much easier in the sense that our reproductive glands are much more accessible. More our less we shine the (right) light and get instant results. I imagine the concept is similar with women but more challenging to implement – which is why there’s this whole “procedure” around it – at least when I look at what is offered with CO2RE. Do you happen to know of any other similar products/services, the science and tech behind this – or where to find out more? Hi Jason, I only have rudimentary knowledge on this topic having just started looking into it. Let me do some additional research and get back to you.